According to a report from Silversurfers.com, 2017 is going to be our year. Yes, we over 50s have indicated that we’re going to be more adventurous than ever in the coming months and we’re also going to demonstrate our metal by not suffering fools gladly and any business that treats us like a bunch of irrelevant old codgers will pay the price. So, brands marketing to the over 50s need to take note. The research report revealed that 92% of us have “had a change of attitude to life” since turning 50 and at least one third of us feel that we’re more assertive than we were in our earlier years. The latter revelation certainly makes sense because we have grown into our skins, so to speak, and know what we really like and dislike, making us more assertive as a result. The discovery that so many in the age group have altered their attitude to life is a very welcome one and certainly something that the consumer brands should pay attention to if they want to retain our loyalty. How do attitudes change at 50? In what ways have our attitudes to life changed? The Barometer poll, which surveyed 1,000 people aged 50 to 80, showed that we are very willing to try something new with over 41% taking up a new sport, whilst 54% said that they now travelled for adventure, not just to relax. Over half of the people responded that they also felt generally more adventurous in their overall approach to life. A significant number stated that their priorities had changed and now only do what they want to do and only see people that they really like. This is also reflected in the percentage of responders who said that felt more confident about their abilities, have stopped feeling the need to be popular, want to get the most out of every day and, as I mentioned earlier, won’t suffer fools gladly. It is also apparent that not only do the over 50s have more time to spend with their families, at least one quarter of the people who took part said that they give more of their time to helping other people. Passing the 50-year milestone also alters people’s thoughts about close relationships, with over 70% agreeing that this particular aspect of life had undergone a significant change, according to the survey results. Almost 60% said that they now no longer felt afraid to admit when they’re wrong, which may account for the two-thirds of over 50s saying that they have a happy marriage. Also, a third of respondents have been married for between 40 to 50 years. We are also more tolerant and more willing to listen to other people’s views without feeling threatened by them. We also feel friendlier and more likely to have a conversation with anyone we meet when we’re out. And, at least one third of us make a determined effort to meet new people and make new friends. More than 40% said they laughed things off more easily and generally just have a more spirited and joyful approach to life. We’re obviously getting better at taking things as they come and not getting wound up when things go wrong. Unless it’s a mess created by somebody we consider a fool. 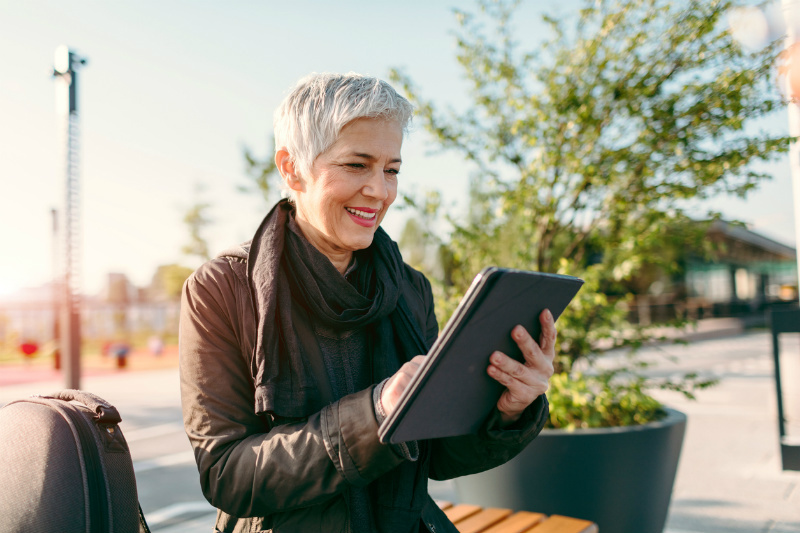 It is clear from surfing the web that certainly those brands and information resources specifically serving the over 50s understand what their audience wants. Healthy approaches to living are a core feature and there is little inclination to only publish articles on topics that might be considered ‘suitable’ for older people. We are supplied with information about the latest trends in healthy eating, whether it is eating kale or exchanging PG Tips for green tea. Skiing and trekking are not just for the fit Thirties and Forties; the over 50s are still taking to the ski slopes and for some of them it may be the first time. We are comfortable talking about ‘life hacks’, can tell Apple from Microsoft and are as comfortable with downloading e-books as going to a book shop or a library for the paper version. The world of finance is very interested in providing us with new products, but we’ve become more savvy about investments and may be as likely to take a punt on collecting wine as open a savings account. Some brands may still be playing catch-up with the over 50s, but they had better get their skates on or they will be the ‘has beens’, not us!